A gripping thriller which twists and turns at a frenetic pace through the streets of Sydney, Dead Lucky stars Rachel Griffiths as a police detective obsessed with avenging the murder of her junior officer. Her partner is a trainee detective, played by Yoson An, who blames her for the death of his best friend. Go deeper into the series Dead Lucky. SBS’s latest Australian drama is part of a crime tradition that’s as old as the genre itself – and as current as today’s headlines. New SBS drama Dead Lucky starring Rachel Griffiths premieres Wednesday July 25, 9.30pm on SBS and at SBS On Demand. 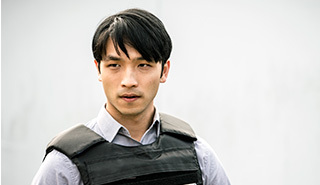 With Hollywood knocking at his door, catch Yoson An has relished the opportunity to take on a lead role in the SBS police drama Dead Lucky. International students should understands their rights and responsibilities. Check out these fact sheets listing important information about housing, employment, health and well-being, legal support and more. Available in 7 languages.